Every day the hilly vineyards of the Valpolicella Classica area are cared for and tended to by our grape-growers, the true guardians of one of nature’s heritages. These precious lands give rise to the Domìni Veneti Amarone, Recioto, Valpolicella and Ripasso wines. In 1989 Cantina Valpolicella Negrar launched an articulated Quality Project: first it identified particularly suitable areas of Valpolicella, putting in a great deal of hard work alongside the grape-growers in order to obtain grapes of extraordinary quality. Their careful selection led to the creation of important crus and a line dedicated to the Domìni Veneti brand. The name refers to the territories belonging to the Serenissima Republic of Venice of the 1500s, when it was at its largest and Valpolicella was an integral part of the same. The splendour of that era is evoked in Domìni Veneti’s values of quality and image, mirroring the more exclusive range of production: the result of the long and integrated winemaking-oenological project to enhance the typical characteristics of the territory. Amarone Espressioni is an oenological project that has become reality: five different crus of Amarone, Castelrotto, Villa, San Rocco, Mazzurega and Monte, each representative of a different valley of the Valpolicella Classica area. 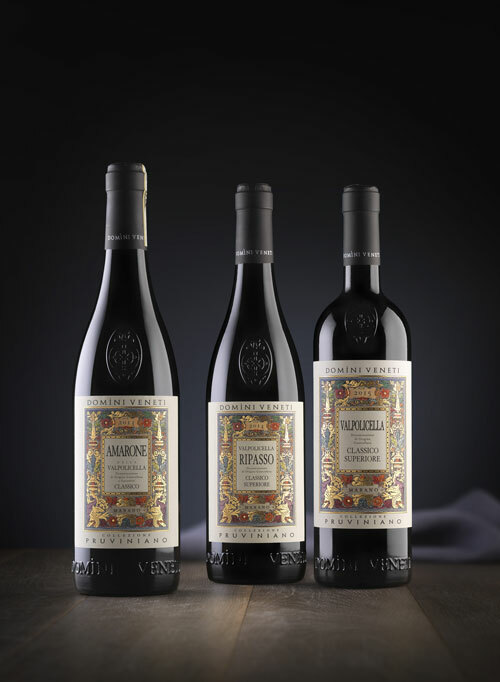 Amarone Espressioni is the synthesis of the Domìni Veneti philosophy, the result of a research project that has lasted over 10 years and conducted in collaboration with the Experimental Institute for Winemaking in Conegliano Veneto and the Winemaking Centre of the Province of Verona. This project takes us beyond the meaning of Amarone, mainly characterised by drying techniques and native vines, to emphasise the different terroirs: new and unknown values on which to base originality and future competitiveness. 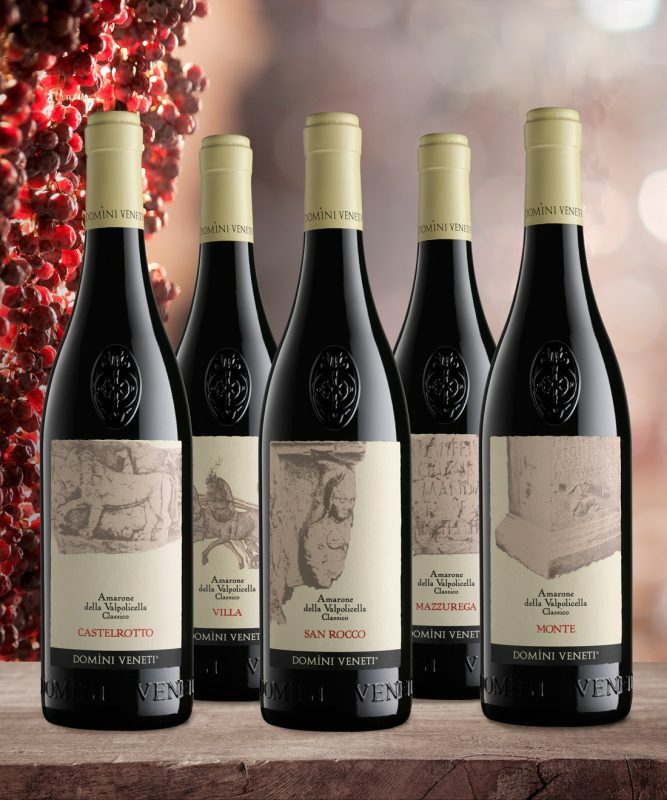 Domìni Veneti continues its journey of discovery and characterisation of the terroirs with a new interpretation of Amarone, Ripasso and Valpolicella Superiore in the valley of Marano within the Valpolicella Classica area. The resulting profile is of subtle elegance, with great ageing potential over time. The Collezione Pruviniano was created in Prognol, a small hamlet of Marano di Valpolicella, where Cantina Valpolicella Negrar has had a new production plant since 2015. The collection has been given the ancient name of the valley of Marano, Provinius, which was mentioned in eighth-century documents and includes the basins of the progni (streams) of Marano and Fumane. The lands of Marano have a great deal of personality: they are cold and have loose soils that must be worked with in order to best interpret the variegated intertwining of perfumes and aromas in the wine made here. It gives rise to elegant and balanced wines with measured sugars and flavours and aromas which are more balsamic than fruity. Its abundance of water, the large number of Veronese testimonies dedicated to the goddess Minerva and the unaltered sacredness of the small church dedicated to the Madonna of Santa Maria in Valverde have led us to attribute a feminine character to the valley, which is also expressed in an elegant label created by graphic designer Manuela Fischetto. The history of Amarone is interwoven with our history. It was 1936 when Adelino Lucchese, the cellar manager of Cantina Sociale Valpolicella Negrar, noticed a barrel of Recioto that had been forgotten. The Recioto had by then “scapà” (escaped) and had become dry. A serious mistake, given that historically Recioto was (and is) a prestigious sweet wine. All the same, before dismissing it as a loss, Adelino wanted it to be tasted by Gaetano Dall’Ora, the current president of the cooperative that had been founded in 1933. Gaetano brought the glass of this unknown wine to his nose and immediately tasted it. The discovery was surprising. Genially inspired and inebriated by so many aromas and flavours, the president exclaimed: “This is not an amaro, it’s an amarone!” (amaro means bitter in Italian). A new name had been coined: Amarone, now famous worldwide. Recioto takes its name from racemes, the minute bunches known as “recie” that grow on the sides of the bunch, like ears. Recioto della Valpolicella is a sweet, red DOCG wine produced exclusively from native vines such as Corvina, Corvinone and Rondinella, but also with smaller percentages of Cruina, Forselina, Negrara and Oseleta, and sometimes Molinara. It has a deep red colour, a fruity aroma and a full, intense and sweet taste. In a word: a real treat. Ripasso is made with traditional techniques that have been rediscovered and enhanced in recent decades. They consist in leaving the Amarone skins in the fermentation vat and adding an equal quantity of fresh Valpolicella wine, thus starting a new fermentation phase lasting about 7 – 10 days. The incredibly successful wine called Ripasso arises from this process. It has a higher alcohol content than Valpolicella, a more intense colour and a complex aroma. You have no choice but to love this wine. Discover the shining stars of our production.